System Redesign Study: This is a project to study our system and suggest possible changes. You can help by adding your input here. Fare Study: This is a study to evaluate RTA’s fare structure and the impact of fare changes on ridership and revenue, to evaluate the potential impact of fare changes on low income and minority populations, and to develop scenarios to balance ridership and revenue goals. Financial Analysis and Economic Forecast Study: This is a study to review our current budget, forecasts, funding structure, efficiencies and best practices. Rail Car Study: A study to help determine the best way to proceed with replacing/repairing our aging rail fleet. All together, these studies will help us make sure that we are delivering the most effective service possible; and that we are making the most informed decisions moving forward. We will keep you informed of the results when any of these studies are concluded. Plan ahead. If you have questions, call the RTAnswerline at 216-621-9500. Automated service is available 24/7. Leave early. Expect large crowds and allow plenty of time to get downtown. Ride the Rapid. Trains will leave frequently during the heavy demand periods. Free parking is available at many stations. (Obey all signs; cars parked illegally may be ticketed and towed.) Service runs until midnight. Ride the HealthLine. It operates 24/7, from East Cleveland to Public Square. Bring exact change. RTA employees will sell round-trip passes for $5 at many rail stations. Store the card in a flat, secure place—you’ll have to show it on your trip home. Use the RTA CLE app. Buy an all-day pass on your smartphone. Looking for parking? Follow us on Twitter or Facebook for updates on the status of Rapid Station parking lots. For safety, travel in pairs. Be aware of your surroundings. Pack lightly. Buses and trains will be crowded; whatever you carry must be held on your lap. Cleveland Police ask that you not bring backpacks, so leave yours at home. Protect your mobile devices. Keep your cell phone secure, and avoid bringing laptops or tablets. Bicyclists beware: When trains are crowded, you will not be allowed to board with yours. Trolley service is free. Look for green vehicles and the unique signs at bus stops. Tell the operator your destination. Trolleys will be routed around the parade, and may be slower because of the crowds. If you continue celebrating after the parade, Trolleys can help you get around downtown. Waterfront Line rail service will be replaced with 67R buses. Use these replacement buses to access stations along the Waterfront. The C-Line Trolley is available direct to Flats East Bank from 11:00 a.m. until 11:00 p.m. Happy St. Patrick’s Day from RTA! Harold Madox loves the thrill of driving. So, after spending some time in Texas, he joined RTA. And over the past 13 years he’s worked as a bus operator, he has fallen in love with his hometown all over again. Harold began his RTA career at the old Harvard Garage, and then moved to the Hayden District. 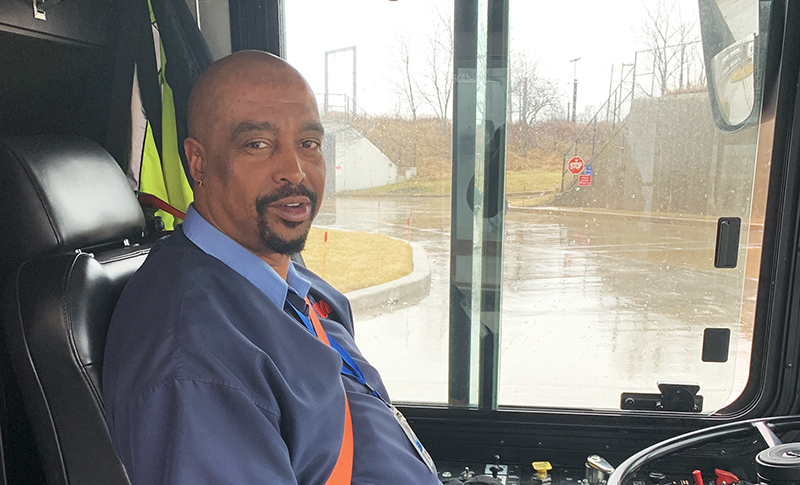 Part of the allure of becoming an extra board operator in the first place was the exciting change of pace, and Harold can definitely testify to this perk—he’s driven nearly every bus route that RTA has offered during his tenure, which has taken him all over Cleveland. Harold says the extra board was a great place to see the sights and meet many new people. And it’s easy to have a great experience when you’re as invested as Harold: he always picked up last-minute shifts, and everyone knew him to be helpful and flexible. In pursuit of a bit more stability, Harold now works a scheduled run. He currently drives the #3 route down Superior, which allows him to build relationships with his passengers—he loves seeing his regular riders. Harold describes the bus as his sanctuary, a place where he can do his best thinking, clear his mind of any stresses, and find peace behind the wheel. Luckily, he has ample time to think, as his regularly scheduled shift is nearly 10 hours long. Outside of work, Harold loves to travel with his fiancé. He’s looking forward to his future with her and plans to eventually retire from RTA—although we hope he won’t leave us for a long time. The Red, Blue, and Green Rapid lines all end at Tower City. The station is an escalator ride away from the theaters. RTA’s HealthLine runs 24/7 on Euclid Avenue and stops directly across from the JACK Casino, adjacent to Tower City. Several other bus routes run 24/7 as well. Trolleys operate around the downtown area, including Playhouse Square, CSU, and the Warehouse District—and they’re free with a smile. Trolleys run on different routes and with different hours during the day, evenings, and weekends. New this year, additional screenings will be held at two other “hubs”: CIFF West in the Detroit Shoreway neighborhood, and CIFF East in University Circle. To easily access CIFF West, ride the #26 bus line. For CIFF East, ride the HealthLine to the Museum Stop. Or ride the Red Line Rapid to the Little Italy-University Circle Station, and the theaters will be a short walk away. For CIFF tickets, visit the Tower City box office. Effective Sunday, March 10, expect some minor schedule adjustments. These changes are being made to better connect our services. New timetables will be available for: 3, 5, 10, 11, 19, 25, 26, 28-28A, 45, 48-48A, 51B/C, 53F, 79-79A, 83, 86, and 94 buses. The Blue and Green Rapid lines will also be changing, but the effective date for this change is March 24th. New schedules will be posted online, and hard copies are available for pick-up at RTA Headquarters (1240 West 6th Street, Cleveland). Baseball is back! The Cleveland Indians play their first home game on April 1 against the Chicago White Sox. First pitch is at 4:10 p.m., but you should arrive early to enjoy Opening Day festivities. And we know the best way to get there: ride any Rapid line to the Tower City Station. From there, it’s a quick stroll through the Walkway to Progressive Field. RTA staff will be selling round-trip passes for $5 at select rail stations, so please be prepared with exact change. Most importantly: have fun, and go Tribe! A reminder for those bringing shopping carts or strollers on RTA vehicles: these items are permitted, provided they stay clear of the aisle and the stairways. Safety is a top priority, so we thank you in advance for your cooperation!